Have you seen those television commercials about used car markets and someone standing in a white background and as they vocalize their automobile preferences the selections fly in and around them. 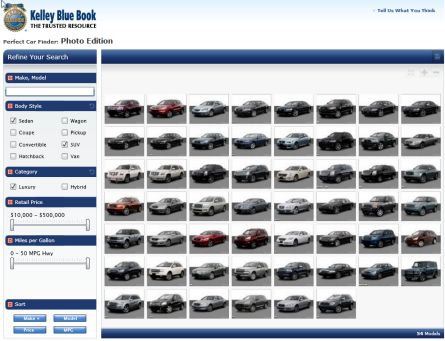 That’s what I was reminded of when I came upon the new feature on Kelley Blue Book’s comparison feature on their site. I had previously written about some innovative uses of DeepZoom with Jose’s samples and I like what KBB has done here as well. They’ve leveraged Silverlight with DeepZoom in a way that provides some good user functionality but at the same time provides a line-of-business application for their organization. You can get to the comparison feature by starting at their Perfect Car Finder® section of their site and clicking the Photo Edition near the bottom of the application. Once launched you are presented with an array of vehicles which you can start trimming down by using the controls to specify your preferences. 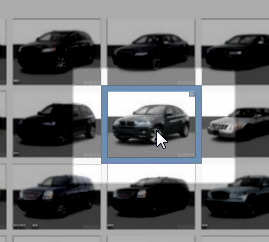 As you enter options the images of vehicles filter and wrap into a new grid view. I did some snooping and was able to spend some time chatting with the developers of this beta application for KBB. It was great to hear how they’ve got to this point in such a short time (abt a week) and with a developer who said this was his first Silverlight application. I like that they had a need for a custom control and built it. If you play around with it on the site you can see that it is basically the Slider functionality with two Thumb controls (which is the direction of my sample as well). Changing these slider values also filters the car selections as well. The car pictures are the DeepZoom portion of the application and do what you’d expect any DeepZoom app to do at this point with some great resolution photos. One thing that KBB has done here is monitor where you (the user) are viewing within the DeepZoom collection and provide some highlighting of the car you are looking at (via a border). 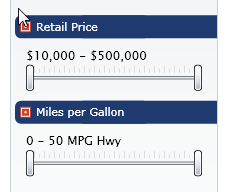 Once you click on a specific vehicle it also zooms directly into that vehicle to provide you additional information. They are making use of knowing where the user is as well as where in the collection that car exists to provide the best functionality to the end user. I think this is another great use of Silverlight and DeepZoom together to provide some business functionality that is fun for the customer and functional for their organization. It’s a great mix of services and client technology. In talking with their developers I made a few suggestions that I think could even enhance the overall user experience and they understand they have some refinement they are desiring to do as well. But from nothing to an integrated experience in a short time is great! I’m looking forward to see how this application evolves. Go check it out and tell them what you think. Great job KBB team!